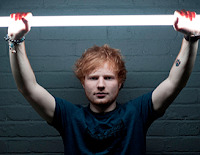 Ed Sheeran has won the award for British Male Solo Artist at this year's Brit Awards! The "Thinking Out Loud" singer-songwriter beat Damon Albarn, George Ezra, Paolo Nutini and Sam Smith to the crown. Ed's also took home the award for British Album Of The Year with his 2014 album x.